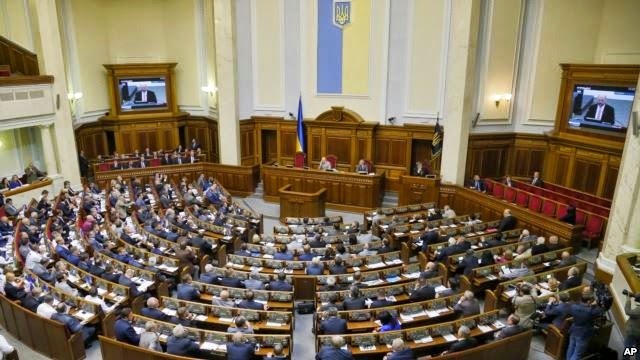 KIEV, Ukraine -- Ukraine's parliament has adopted legislation granting greater autonomy to the separatist regions in the east of the country, as well as amnesty for most of those involved in recent fighting with government forces. Members of Ukraine's Parliament are seen in session in Kiev Sept.16, 2014. The new laws, which were proposed by Ukrainian President Petro Poroshenko, are aimed at ending a five-month separatist rebellion, which to date has claimed an estimated 3,000 lives and paralyzed Ukraine politically and economically. Under the legislation, rebel-held parts of Ukraine's eastern Donetsk and Luhansk regions will be granted a "special status," giving them broader autonomy for a temporary three-year period. Additionally, the new laws envision aid to restore the regions’ damaged infrastructure and the provision of social and economic assistance to hard-hit areas. A separate bill grants amnesty to "participants of events in the Donetsk and Luhansk regions," an apparent reference to separatist fighters and to Ukrainian government troops and volunteer battalions. Excluded from the amnesty would be those who committed "grave crimes" and those who were involved in the downing in July of Malaysian Airlines flight MH17. Ukraine’s president, Petro Poroshenko, said the laws would guarantee the "sovereignty, territorial integrity and independence" of Ukraine, while paving the way towards a decentralization of government, which had been among rebel demands. Separatist leaders played down the significance of the move. Alexander Zakharchenko, prime minister of the self-proclaimed Donetsk People's Republic, told Russian state news agency RIA Novosti that the legislation still needs to be signed by President Poroshenko and published before it becomes law. "Then we will translate it into Russian, study it and give our opinion," he said. Zakharchenko's first deputy, Andrei Purgin, told RIA Novosti the legislation could serve “only as a reference point for future dialogue, not as a legislative act," adding that laws governing the Donetsk People's Republic are made by its own parliament, not the one in Kiev. Also Tuesday, Ukraine's parliament ratified a landmark political and trade agreement with the European Union, whose rejection last November by the previous Kiev government under president Viktor Yanukovych led to massive street protests that culminated in his ouster in February. Ratification was synchronized with that of the European Parliament in Strasbourg, with both legislatures, via live video link, voting overwhelmingly in support. The agreement includes free-trade privileges, and supports reforms in core sectors in Ukraine, putting the country on a path to economic recovery and opening the door for its eventual membership in the European Union. Ukraine’s pro-Europe orientation and its deal with the EU have been strongly opposed by Russia, which after the fall of Moscow-backed Yanukovych moved to annex Ukraine’s Crimea and is widely believed to have fomented and actively supported the bloody separatist rebellion in eastern Ukraine. Moscow continues to lie and denies the charge. In a concession to Russia, the EU and Ukraine agreed last Friday to delay implementation of the free-trade part of the deal until the end of next year. Commenting on Russia’s opposition to the deal, experts say Moscow’s concerns were primarily political in nature. “Ukraine is becoming a European country, which is a danger for the Kremlin, not for Russia as a country, but for the Kremlin,” said Olexiy Haran, a political science professor at the University of Kiev-Mohyla Academy in Ukraine’s capital. Russia looks to boost troops in Crimea Russia's defense minister called Tuesday for bolstering the country's military presence on the Crimean peninsula, while another top official accused the West of pushing the world toward a new cold war. Defense Minister Sergei Shoigu said deploying "proper and self-sufficient forces" in the direction of Crimea is a top priority. He said such a step was needed because the situation in Ukraine has "escalated sharply" and also because of an increased foreign military presence "in the immediate vicinity" of Russia's borders. The U.S. military is currently leading peacekeeping exercises in western Ukraine involving 15 nations. Exercise Rapid Trident, which runs through September 26, is being conducted near Yavoriv at the International Peacekeeping and Security Center, approximately 60 kilometers from the city of Lviv in western Ukraine. According to the Pentagon, about 1,300 personnel are taking part in the drill, including 200 U.S. soldiers. Meanwhile, the speaker of the lower house of Russia's parliament - the State Duma - accused the United States and its allies of pursuing a policy that is "pushing the world to the brink of a new cold war." Sergei Naryshkin cited reports that some NATO countries have promised Ukraine weapons and military hardware. NATO officials have said the alliance will not send weapons to Ukraine, but that individual countries may choose to do so. The Russian ruble fell to new lows on Tuesday trading at 38.93 against the dollar. It briefly fell below 38 rubles per dollar for the first time ever Monday. The White House says the development is a direct result of U.S. and European sanctions imposed against Russia over its role in the conflict in Ukraine. "It is evidence that Russia is paying a price,” White House spokesman Josh Earnest told reporters. Quote from ForUm: "Стоимость угля, импортируемого из ЮАР для потребностей подконтрольной государству энергогенерирующей компании «Центрэнерго», составляет $91 за тонну в украинском порту, тогда как российский уголь обойдется компании по $80 за тонну, сообщил министр энергетики и угольной промышленности Юрий Продан." Ukrainian Government should consider to purchase an American coal due to a lower coast, even this this additional expanse for transportation. Ukrainian Government if interested could compare for them self, that even with an addition cost for transportation and charges of assisting local company coal from USA will be 16% cheaper than from South Africa and 3% cheaper than from Russia. High quality coal from Central Appalachia with 12,500 Btu and 1.2 SO2 will cost at Ukrainian port as low as $77 per short ton. Quote: "Полгода назад украинское правительство объявило о начале налоговой реформы. Планировалось уменьшить количество налогов с 22 до 9. Однако в реальности был введен новый военный сбор. А заявление об отмене налоговых льгот для аграриев подняло на уши фермеров всей страны." "По мнению Андрея Новака, на сегодняшний день единственной политсилой, которая сконцентрировалась на проблемах селян и фермеров, является новая политическая партия «ЗАСТУП». «Упрощенная система налогообложения, учета и отчетности, предложенная партией «ЗАСТУП», укрепит сектор малого и среднего аграрного производителя», — отмечает Андрей Новак. По словам эксперта, партия предлагает принять ряд важных для отрасли реформ. В частности, сохранить специальный налоговый режим для производителей сельскохозяйственной продукции и ввести налоговые «каникулы» для начинающих фермеров. Это, по мнению Андрея Новака, позволит малому и среднему бизнесу развиваться. ForUm"
Ukrainian agrarians must fight to increase Tax brakes for agricultural sector including simplifying Tax system and lowering the Tax throughout the whole sector. Quote: "Сахарные заводы по состоянию на 15 сентября произвели 130 тыс. тонн сахара. Об этом сообщил председатель ассоциации «Укрсахар» Николай Ярчук. По его словам, на сегодняшний день собрано и завезено на сахзаводы почти 2 млн тонн сахарной свеклы, передают «Украинские новости». Представитель отрасли также добавил, что, по состоянию на сегодня, работают 32 завода. На эту же дату в прошлом году работало 3 сахзавода, было произведено 18 тыс. тонн сахара." Ukrainian Government should consider cooperation and experience transfer from Brazil. Brazil successfully implemented its fuel independence program. It took Brazil some 30 years to implemented but it can be considered a success story. Nationwide, average retail gasoline prices are nearing the all-time inflation-adjusted high of $3.40 a gallon reached in 1981, lending urgency to renewed calls for U.S. energy independence. Analysts often tout Brazil as the epitome of energy self-sufficiency. Brazil imported more than 80 percent of its oil in the 1970s, but it likely reached energy independence by the end of 2007, according to projections from the U.S. Energy Information Administration (EIA). Brazil's success is commonly attributed to its thriving ethanol market, but this is at most only a small part of the story. More critical to Brazil's energy independence is its significant increase in domestic oil production. In December, President Bush signed into law the Energy Independence and Security Act of 2007, which mandated that refiners increase the amount of ethanol blended into gasoline from 5.4 billion gallons in 2005 to 9 billion gallons in 2008 and 36 billion gallons by 2022. This policy seeks to emulate Brazil by increasing the use of ethanol, but in many respects it is misguided because Brazil's energy situation is so different from that of the United States. Brazil's Ethanol Program. In 1975, primarily in reaction to skyrocketing oil prices, Brazil launched its National Alcohol Program, ProAlcool.